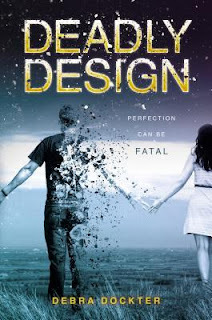 Deadly Design by Debra Dockter is a new YA sci-fi out tomorrow! Deadly Design is about a genetically modified set of twins, Kyle and Connor, who were born two years apart. When Connor's heart stops on his eighteenth birthday, Kyle discovers that other genetically modified teens are dying when they reach eighteen, too. He's spurred into action, not just to discover why his twin died, but to save his own life. Debra is here today to talk about villains! Villains! Where would our characters be without them? Any fan of Marvel or DC comics knows the importance of good villains. Indeed, any reader of fiction knows that without a good antagonist, a protagonist is about as interesting as watching a relative taking a nap. Without action and danger and those moments of heart-stopping conflict, a story would be…pointless. As readers, we want to step out of the ordinary, day to day, of our lives. We want to know who the enemy is and we want to bite our nails while the good guy tries to defeat whoever is standing in the way of him getting the happiness he deserves. Kyle, the main character in Deadly Design, is an exceptional sixteen-year-old. When the protagonist has a lot going for him, he needs to have at least that much – if not more – going against him. Enter the mysterious Dr. Mueller. Mueller is part mad scientist, part psychopath, and part twisted humanitarian. He’s also part artist, only instead of painting on a canvas, he creates in a laboratory by manipulating genes. That’s how he created Kyle and the other superior beings from New Genesis. The doctor may be evil and crazy, but as readers get to know Kyle, his twin brother, Connor, and the other teens designed by Mueller, I doubt they can stop themselves from admiring Mueller’s handy-work at least a little. Villains should have some redeeming qualities, and the truth is, no matter how evil he is, Mueller is very good at creating human beings the readers will hopefully come to love. Besides his brilliance in genetic manipulation, Mueller is a compelling villain in that he believes in his cause. Most psychopaths don’t have causes. They have desires to hurt and maim, manipulate and kill, but they usually don’t aspire to winning a Nobel Peace Prize. It’s this difference that makes him so creepy! He believes in his work. He regrets nothing. There’s a scene in the book, one of my favorites, where Kyle finally gets to meet his arch nemesis. Kyle is funny, smart, and exceptionally good looking. He basically has qualities rivaling those of any Greek demi-god. In that moment in the book (no spoiler alerts), it’s like Leonardo Da Vinci being reunited with his masterpiece, the Mona Lisa. He treasures his creation – his art – but he’s fine with the idea of dousing it in gasoline and lighting a match. Dr. Mueller is a chilling, intelligent villain – the perfect foe for Kyle to try to defeat. But how do you defeat DNA? How to you crack the code to your own body’s chemical make up? But Kyle has to find a way or he and the others created in the New Genesis labs won’t survive past their eighteenth birthdays. And just in case you’re thinking this is a story about a battle between a sixteen-year-old boy and a mad scientist, you might want to think again. After all, what’s a story without some unexpected twists and turns? Deadly Design is out tomorrow! The premise sounds very compelling. I also like a villain to be well rounded. Sounds like Dr. Mueller is.